Prominent & Leading Manufacturer from Mumbai, we offer pp needle punch non woven geotextiles. 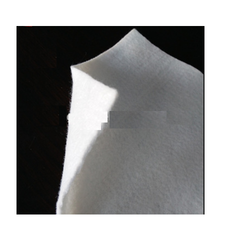 We can manufacture PP Nonwoven Needle punched Geotextiles on PP Staple Fiber Needle punched Technology. Needle-punched non-woven Geotextiles are made from polypropylene fibers that are tangled together by a needle-punching process. The fibers may be made in continuous or short lengths (the short length fibers are called staple fibers) and achieve their strength by interlocking. Needle-punched non-woven Geotextiles have excellent water flow rates and are used for filtration of soil fines for drainage applications including trench drains, as a wrapping for perforated pipe, for erosion protection, and combined with three-dimensional structures to create prefabricated drains. They are also commonly used with geomembranes to provide a protective cushion.